Abundant research has shown that the endorsement of performance–avoidance goals in academic contexts is associated with negative outcomes, including poor academic achievement. 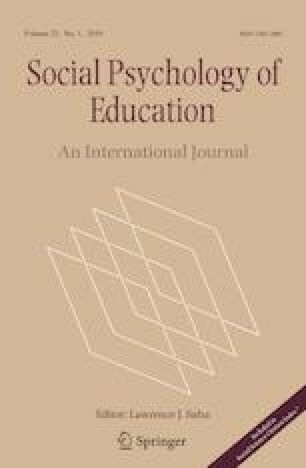 The present study tests students’ social class as a moderator of the relationship between performance–avoidance goals and achievement. Two hundred thirty students (106 lower-class students and 124 upper-class students, Mage = 18.57, SD = 1.28) were asked to report the highest academic degree obtained by their mother and father and complete a performance–avoidance goal scale. Participants’ initial academic level was measured. In addition, depending on the condition, they were led to believe they had great (vs. poor) chances to succeed at the university. They then solved Advanced Progressive Matrices measuring their achievement. As expected, performance–avoidance goals negatively predicted achievement only for lower-class students, and this moderation mainly appeared for high academic achievers. The manipulation of the success versus failure expectancies did not moderate the effect. These results confirm that the adoption of performance–avoidance goals would be especially deleterious for lower-class students who succeed, supporting an interpretation in terms of the upward mobility process lower-class students achieve when succeeding in higher education. This research was supported by the Conseil Régional Auvergne Rhône Alpes. The authors declare that there are no potential conflicts of interest with respect to the research, authorship, and/or publication of this article. DeRosa, E., & Dolby, N. (2014). “I don’t think the university knows me.”: Institutional culture and lower-income, first-generation college students. InterActions: UCLA Journal of Education and Information Studies, 10(2). Retrieved from https://escholarship.org/uc/item/0kj6m6r8.